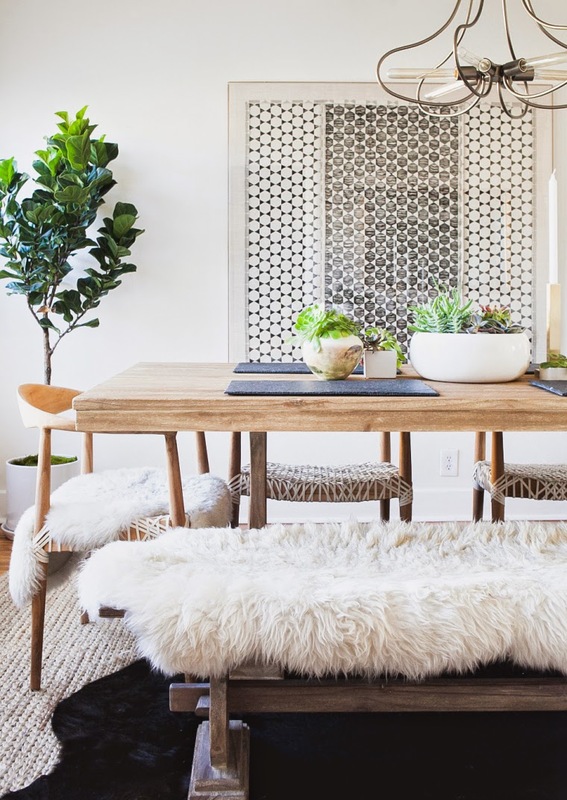 This bright and airy space was designed by Orlando Soria, Creative Director at Homepolish and blogger of Hommemaker, for Fashion Toast's Rumi Neely. My favorite elements of this room are the modern chairs and beautiful framed textile from St. Frank. The light wood tones and furry throws make this dining space warm and inviting, and contrast well with the deeply saturated cowhide rug. This dramatic space has one spectacular element - the arctic pear chandelier by Ochre. An eye-catching chandelier is essential in any dining space, and particularly useful in open floor plans to help define the space, as in this kitchen/dining room. 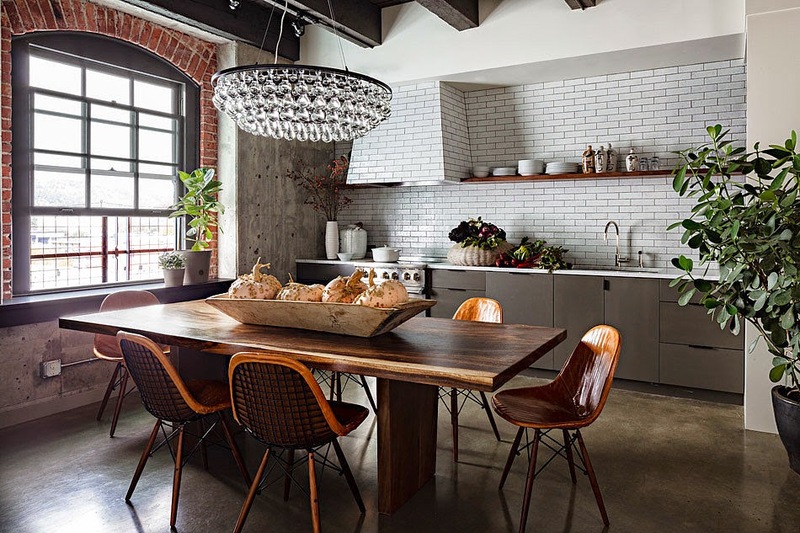 The beauty of the live edge wood dining table and rich caramel leather eiffel chairs contrast and warm the 'colder' materials of cement, glass, brick, and tile that are a prominent feature in the room. Less is more in this open plan dining space of Athena Calderon, designer and blogger behind Eye Swoon. Bold black accents in the mid century chairs, medieval chandelier, modern sconce, and beautiful antique credenza are prominent yet not overpowering, creating a cohesive, relaxed rustic feel. The design of this rustic modern space is enhanced with the raw elements of the room: hardwood floors and an exposed ceiling. 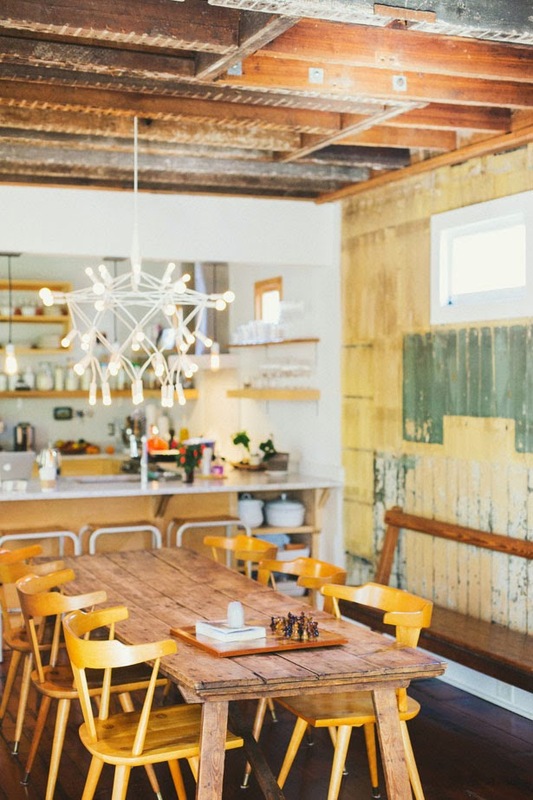 I love the mix of styles in this room as well: the farmhouse plank table, mid century Paul McCobb chairs, and modern Patrick Townsend Orbit chandelier. 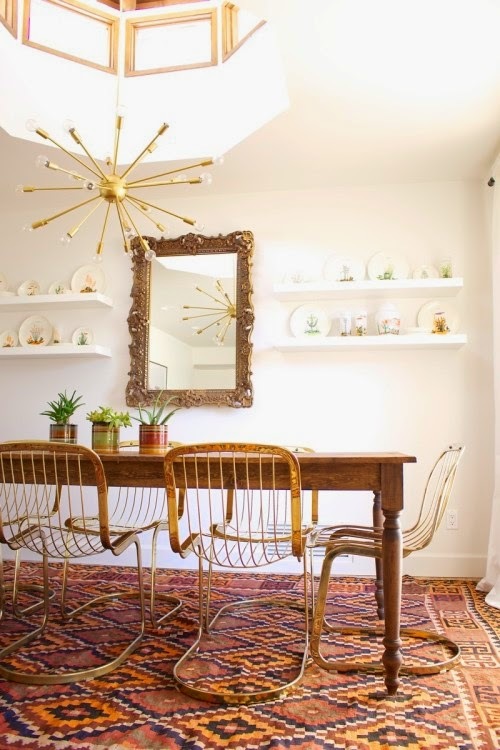 While the gilded mirror and china display aren't really my cup of tea, those beautiful brass Cidue Vicenca cantilever chairs, kilim rug, and farmhouse table are something out of my wildest design dreams. It's really those brass chairs that get me. I am officially on the hunt for these babies. What a nice dining room it is! I think that the dining room has been more beautiful for the deeply saturated cowhide rug. Besides, the beautiful brass Cidue Vicenca cantilever chairs, kilim rug, and farmhouse table can increase the smartness of a dining room. I have gained much knowledge to decor my dining room by the assist of your blog. So, I am grateful to you.